In a video made for the National Resources Defenses Council (NRDC), the Hollywood stars accuse Scott Pruitt of wanton profligacy while in office. “Pruitt is polluting the swamp,” they claim. “He spent tens of thousands of dollars decorating his office, including re-furnishing an antique desk, and building a $43,000 soundproof phone booth,” says Stevens. “And by the way his allowable budget for this sort of thing is $5,000,” says Slattery. “Basically he thinks laws don’t apply to him,” the Mad Men star added. “He demanded his security service run red lights, break the spirit, use emergency sirens to transport him during non-emergency travel,” says Stevens. “Basically getting the exact same treatment as the President,” Slattery doubles down. This campaign is the latest in a series of co-ordinated assaults on Pruitt by environmental activists outraged at his success in rolling back Barack Obama’s green agenda and implementing President Trump’s campaign promises on energy and environment issues. The NRDC — with an annual budget of $151 million — is one of numerous activist groups attempting to oust Pruitt. 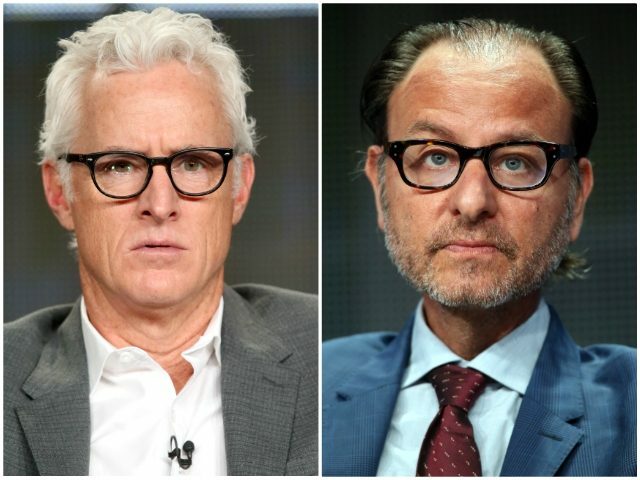 Slattery and Stevens, like many Hollywood actors, are seasoned environmental activists. Slattery has campaigned for groups including EarthJustice. Stevens, still probably best known as an Eighties teen actor in films like Short Circuit and Short Circuit 2, directed the 2016 environmental documentary Before the Flood starring Oscar-winning actor and enviro activist Leonardo DiCaprio.